It’s not hard to find great places to shop in Richmond—ranging from the busy malls of city centre to the independent stores of Steveston. But fans of top-drawer brands who also love finding great bargains regularly flock to one particular local spot that has become an enticing shoppers’ paradise since its opening day in 2015. 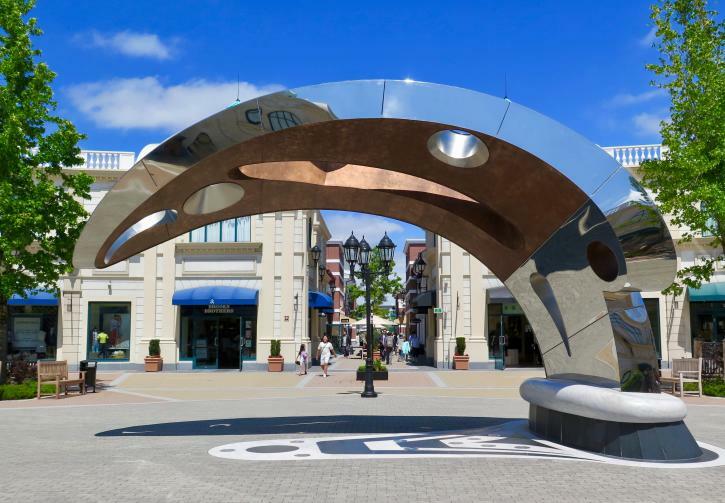 McArthurGlen Designer Outlet Vancouver Airport serves-up a shopping list of more than 70 stores in a faux-European village complex that feels like a Disney Epcot district. Parisian-look façades, gabled redbrick buildings and Bavarian-style timber-framed halls line its brick-paved pedestrianized streets—along with visitors clutching armfuls of famous label store bags. The photogenic setting is attractive, of course, but it’s the shops most visitors are here for. 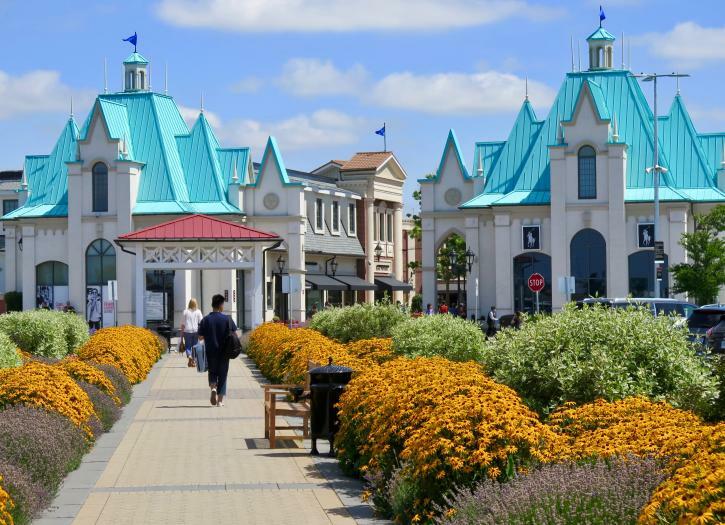 Read on for where to direct your retail therapy activities at McArthurGlen—and discover some of the additional unique features of one of BC’s favourite destination outlet centres. With dozens of well-known branded stores to explore, you’re spoiled for choice when it comes to exercising your credit cards here. Clothing dominates, with brands from Guess to Armani and from Calvin Klein to Banana Republic. For men, don’t miss Brooks Brothers or Ted Baker, and be sure to stock up on jeans at the Levi’s outlet. We also spotted wardrobe staple polo shirts at the upstairs menswear area of Polo Ralph Lauren reduced from $89.95 to $49.95. Women have even more to explore. While stores like Polo, J. Crew and Club Monaco cater to both sexes, their womenswear departments are noticeably larger: we spotted dramatically reduced summer dresses at J. Crew and linen skirts at Club Monaco. The Kate Spade New York store was also extremely popular, while nearby Coach had a line-up of shoppers keen to peruse its luxe bags and accessories. The trick, of course, is to take your time browsing the shops. Keep in mind that many of the stores here also have additional clearance rack areas, typically tucked into the back of the store. But it’s not just about designer clothing. 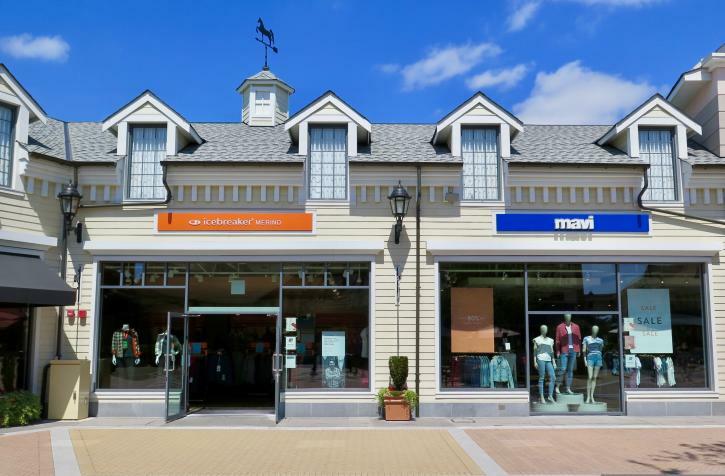 There’s also a great selection of sports and outdoor stores here—including Nike, Puma, Columbia and Mountain Warehouse—plus specialty outlets including Zwilling, Body Shop and Watch Station. Looking for gifts? Check out the cute accessories at Folli Follie or the discounted soaps, locations, and other goodies at Crabtree & Evelyn. One of our favourite specialty stores here is Lindt—and not just because they usually offer a chocolate sample when you walk in. There are lots of chocolate bars and selection box deals in this shop but the best time for bargains is just after Christmas, Easter, or Halloween when there are irresistible reductions on holiday-packaged items. When it’s time to rest your weary wallet, you’ll also find more than a few non-shopping things to do here. Start with the installations: a synchronized water fountain display with multicoloured lights and—the outlet’s centrepiece—a huge public art sculpture called SEI made from marble, granite, copper, and shiny stainless steel. Twelve metres long and weighing 3,800kg, this abstract invocation of a breaching whale was created by artist Michael Nicoll Yahgulanaas who is famous for fusing Haida and Japanese manga themes. A short walk away—just steps from the Fraser River shoreline—there’s also an evocative Musqueam First Nation installation. 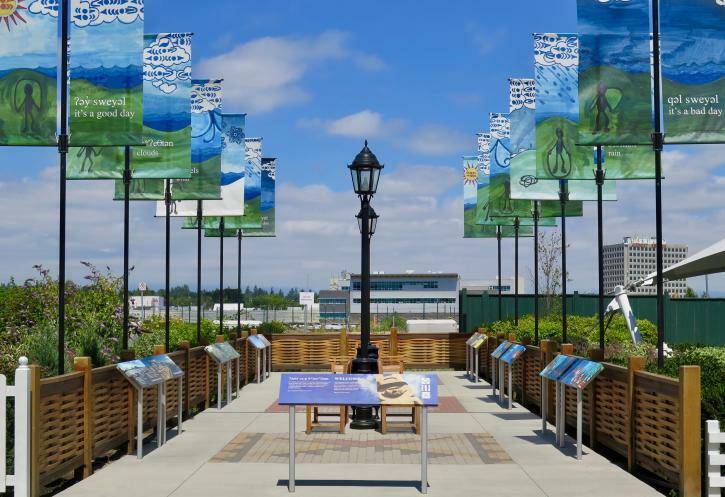 Signifying the Musqueam’s traditional ownership of the area, its information panels illuminate the history of the land and its original people, alongside colourful artworks depicting ancient scenes. Next to the Musqueam area, there’s also a highly popular covered play area for kids. 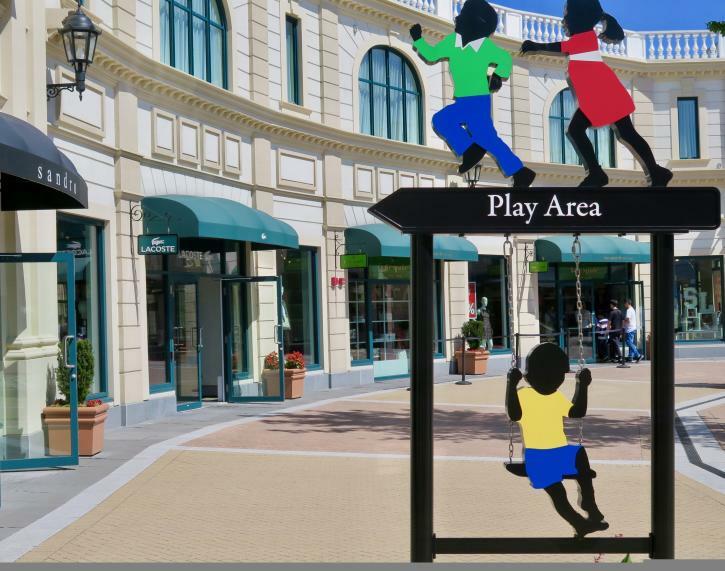 Lined with slides and climbing equipment, this well-designed corner is where you’ll find most children hanging out at McArthurGlen Designer Outlet Vancouver Airport. And if they need some new clothes, you can also usher them over to the nearby Carter’s and OshKosh outlet store. 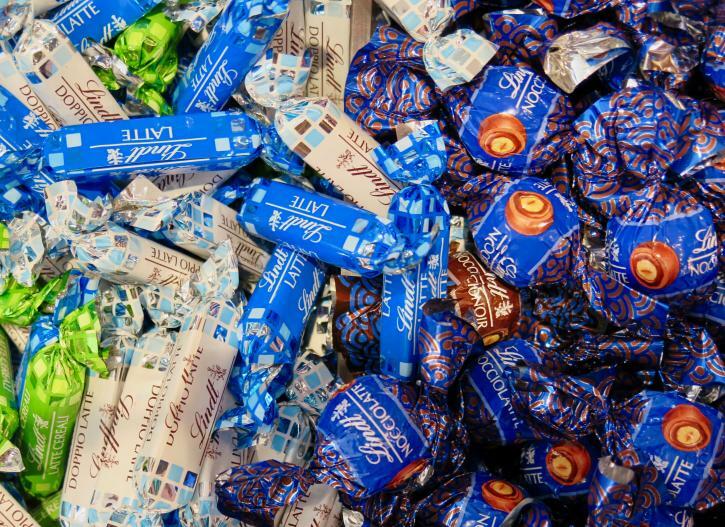 If all that shopping has left you hungry, you won’t have to survive on Lindt samples alone. As well as its popular Caffè Artigiano coffeeshop—housed in what looks like a Parisian wrought-iron building—there are several places to dine here. From Café Crêpe to Hugo’s Churros and from BIBO Pizzeria to Neptune Noodle House, there’s a full menu of options. One of the most popular is Japadog, the fusion Japanese hotdog joint. Arrive off-peak for a seat and dive into their Ebi Tempura, a crunchy shrimp tempura on rice inside a hotdog bun. It’s the perfect way to fuel-up for that final bargain-hunting tour around the mall. McArthurGlen Designer Outlet Vancouver Airport is a five-minute walk from Canada Line’s Templeton Station. Also, if you’re at the airport and have time to spare before a connecting flight, Templeton is just a four-minute hop from YVR-Airport Station—it’s also a free trip: scroll through the onscreen ticket machine options at YVR-Airport and select “Sea Island Only” for your free ticket. If you’re driving, the mall has lots of free parking.